On January 14, Pro-Palestinian activists in Lebanon attacked Starbucks, causing the branch of the U.S. coffee shop chain to close its doors. The protesters accused the coffee chain of supporting the Israeli army and the attack in Gaza, basing their protests on a letter that indicates that the company’s chairman and president, Howard Schultz, has been donating money to Israel. Starbucks has vehemently denied this on their website and apparently the letter was published on an Internet site by an Australian anti-Zionist, who made it clear that he wrote the letter as a parody... Unfortunately, the same violent protests have still been happening, not in only Lebanon but in other parts of the world as well. Hmm. Can Starbucks sue that Aussie dude for libel? In other news, I am personally boycotting Starbucks until they give me my free Starbucks Planner for 2009. I have checked a dozen Starbucks shops in the past 2 weeks, and they're all out. :p The one in SM Batangas even said I have to wait until March! Wowowow. 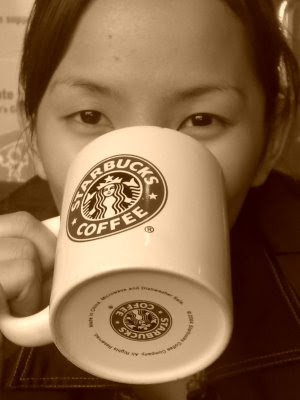 :p I guess I'll have to make do with my Nescafe Instant Taster's Choice coffee or Kopi Roti sa kanto for the meantime. Or they just ran out.